Royal Jordanian has interesting fifth freedom flights out of Bangkok to HKG, CAN, and KUL. This time, I was flying their route from BKK to CAN in Crown Class (what they call their business class product). My first impressions of the cabin were not great. The cabin looked old and tired, and the seats were quite worn down. I was originally assigned seat 2K, but there was something wrong with the arm rest of the seat, so a flight attendant asked me to switch to seat 1K. In business class, there ended up being 5 passengers. The cabin had 4 rows of seating in a 2-2-2 configuration. I was offered a pre-departure beverage of water, orange juice, or apple juice, and then I was given a menu and wine list, headphones (noise-canceling), and offered some Arabic coffee (although no dates). Just based on the way the female flight attendant offered me the menu, I knew that she’d be great. There was a pillow and blanket at every seat. The pillow was large and fluffy, and the blanket was light. The seat was actually pretty comfortable for lounging, and there was plenty of legroom, but it just looked a bit old and worn. No real complaints for a short hop to Guangzhou. The flight time to Guangzhou was 2 hours and 45 minutes. I had pre-ordered a special meal, and the flight attendants noted that it was on the manifest (and on my boarding pass), but for whatever reason, my special meal wasn’t catered. When the flight attendants found out about this mistake, they were super apologetic and tried their best to figure out something that would work. They even offered me things from their crew meals, but I told them it really wasn’t necessary (I was pretty full from grazing in three different lounges at BKK). I ended up receiving the noodles and stir-fried vegetables that came on the side of the fish entree. The food wasn’t great (the salad appeared to be served without dressing, the bread was bad, the noodles were quite salty, dessert was fine), but I wasn’t very hungry. After a few bites of the meal, I ended up reclining my seat and taking a short nap. The bed is angled flat, and it was actually pretty comfortable. 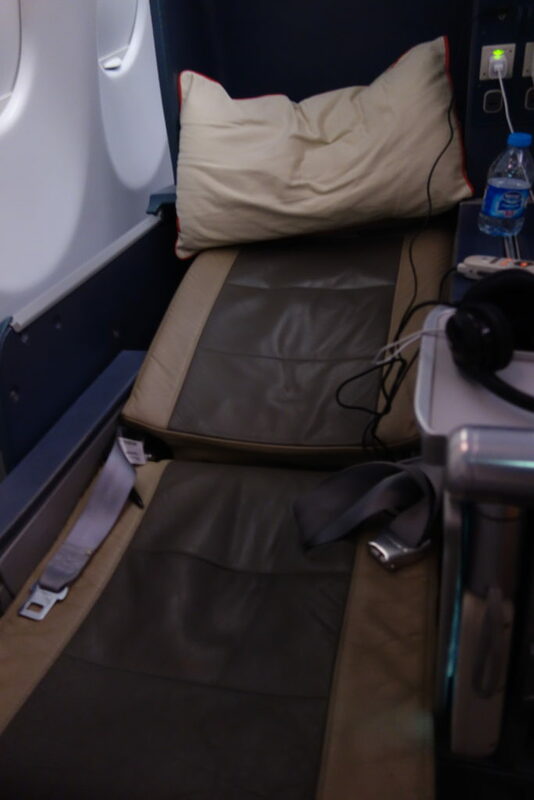 It reminded me of American Airline’s old “next generation business class” seat, which I’ve slept in just fine. Obviously, there are much better business class seats out there, but this wasn’t bad for a short flight. Overall, Royal Jordanian wouldn’t be my first choice, but I’d be happy to fly them again. The best part of the flight was the service from the female flight attendants. This entry was posted in Royal Jordanian, Travel, Trip Reports and tagged a330, business class, royal jordanian, travel, trip report on October 10, 2017 by Edward. I’ve flown Cathay Pacific’s A330 within Asia in business class multiple times (including on the reverse direction of this route), but this time I was in Cathay Pacific’s economy class on the A330. Boarding was a bit of a zoo. They put on the boarding passes that you should get to the gate 40 minutes prior to departure, but boarding didn’t actually start until 20 minutes prior to departure. At BKK, you do scan your boarding pass upon entering the gate area, though, so you don’t need to scan your boarding pass again to board the plane. I unfortunately don’t have many pictures of the cabin because boarding was the aforementioned zoo and the cabin was quite full. After getting comfortable, the service manager on the flight came up to me to welcome me and give me a bottle of water, which I thought was a nice touch. I believe she greeted all oneworld Emeralds on the flight. Cathay Pacific’s in-flight entertainment system (Studio CX) has a great selection, but they do play ads before movies. At least you can fast forward through them. There was also a power outlet at every seat. I had pre-ordered a vegetarian special meal, and the VGML was fine. It was vegetables, some tomato-y sauce, and polenta. It was served with fruit, soy milk (yum! ), bread, and juice. Even though this was only economy class, I felt like I received great service. I was referred to by my last name by multiple different flight attendants (e.g. when I went to the bathroom and when my tray was cleared), and the flight attendants were gracious, attentive, and seemed to genuinely enjoy their jobs. It probably helped that I had oneworld Emerald status on this flight, but flying on Cathay is such a stark departure from flying on American carriers. The service in economy class on this flight was better than the majority of my domestic business class flights in the US. A great product in the air and awesome lounges in Hong Kong (even for business class passengers or oneworld Sapphire members) make Cathay Pacific one of my favorite airlines to fly. This entry was posted in Cathay Pacific, Travel, Trip Reports and tagged a330, cathay pacific, economy class, flight review, travel, trip report on July 3, 2016 by Edward. I had the pleasure of flying Cathay Pacific’s A330-300 from Hong Kong to Tokyo. This was three-class configuration (business class, premium economy, economy) with lie-flat seats in business class. The seats are reverse herringbone, and they’re almost identical to the seats in Dragonair’s first class cabin on the A330. This plane felt a little bit older, and there’s more leather in the finishings. For flying from Hong Kong to Tokyo on Cathay, there are a lot of choices in terms of planes and configs, but this is the nicest in business class–for first class, you have to fly to Haneda instead of Narita. The business class cabin was pretty full. I was offered a pre-departure beverage and a blanket that was unwrapped in front of me. They also passed out hot towels, as opposed to the wet towelettes that you get on Dragonair. As other examples of small things that can make service great, I asked for a pen from one of the flight attendants who happened to be filling out paperwork. She literally just gave me the pen that she was using. The in-flight service manager also came around to greet me and thank me for flying Cathay. When the beverage cart was going through the aisles, I noticed that the flight attendant had a cheat sheet attached to the cart with passenger last names, special meal orders, and indication if the passenger was a oneworld emerald. For my beverage, I asked for a chilled Hong Kong style milk tea, which is not on the menu, but they produced a good beverage for me. Not as good as the canned stuff on Dragonair, but I appreciated the effort. For my meal, I pre-ordered an AVML or Asian vegetarian meal. First up was spiced chickpeas on something that was cold and green and mushy. It was perhaps made of smashed peas. The roll was served nice and warm, but the silverware was bone-chillingly cold. For my main course, I was served some rice with lentils, okra, and green beans. It was tasty, spicy, and cooked well. I was very happy with this dish. For dessert, they first offered fruit and cheese from a cart. Then it was Haagen Dazs ice cream with coffee and tea. And then pralines. The meal service was pretty lengthy, as it took them about two hours to finish up on a flight that’s less than 4 hours of flight time. Cathay is definitely one of my favorite airlines. The service is great, the hard product is great, and the food can be great. This entry was posted in Cathay Pacific, Travel, Trip Reports and tagged a330, avml, business class, cathay pacific, travel, trip report on November 22, 2015 by Edward. This flight was served by a three-class plane (i.e. with first class, business class, and economy class cabins), but it was sold as a two-class flight. I was able to select seats in the “first class” cabin, presumably because of my oneworld emerald status. There was only one other passenger seated in the first class cabin with me, even though business class was quite full. The first class cabin has reverse herringbone seats. These are super comfortable seats and are roughly the same product as US Airways Envoy class (aka American Airlines A330s now) and American Airlines business class on their 777-300ERs. It’s also essentially the same product that Cathay Pacific has in business class on many of their planes. On this flight, the business class cabin has a regional business class configuration that’s essentially the same as the business class product that I flew from HKG to DPS. These seats are great. They’re large and spacious. The cabin is only 8 seats on these planes, so it feels extra private. The foot areas are slightly larger on the window seats than the center seats. There’s plenty of storage with overhead bins, under the footrest storage, side compartments, and shoe storage. The armrest is also adjustable to give you extra width when you’re lying flat. When I boarded the plane, I was escorted to my seat in 1K. The flight crew was on their game and made sure to take care of the little things like unwrapping my blanket for me rather than just giving it to me in plastic. I was offered a pre-departure beverage of water or juices, but I definitely heard a champagne bottle pop, so other passengers were partaking in more festive drinks. Again, no hot towels on this flight, but they instead used packaged moist towelettes. I was offered a newspaper from a cart, and I asked for a copy of the International New York Times, even though I didn’t see it on the cart. Magically, though, they produced a copy. On this flight, I decided to pre-order a vegetarian Jain meal (VJML). This is similar to an AVML, but there’s no dairy, root or bulbous vegetables, or mushrooms. The first course of fruit was super tasty with nicely ripe fruit. The main course was similarly delicious with flavorful and spicy vegetables served with some bread. It was small portion, but it was a great and tasty meal. Given how much I enjoyed the chilled Hong Kong style milk tea on my previous Dragonair flight, I had to have another on this flight. Seriously, order it! It’s delicious. And even though it was completely unnecessary on this relatively short flight, I did try using the seat in lie-flat mode. Not only can you lower the armrest, but there’s also an additional flap that comes up to give you even more surface area to lie on. Overall, I was super impressed by Dragonair. Great service, great food, and great hard product. What more could you ask for? This entry was posted in Dragonair, Travel, Trip Reports and tagged a330, business class, dragonair, flight review, travel, trip report on November 21, 2015 by Edward. The boarding time was stated as 4:40pm, but that’s just when the gate opens and you can start going through the additional security check at the gate. Boarding didn’t actually start until 5:20pm. Business class was a 2-2-2 configuration on this plane for a total of 42 seats. The cabin was relatively full with only 6 empty seats. I was offered a pre-departure beverage of water, champagne, orange juice, or guava juice. I’m a big fan of Cathay Pacific. The seats looked new and stylish, although they’re just basic recliners, so they probably wouldn’t be too comfortable on a long flight. But for a 3.5 hour flight, the seats are fine. They served dinner on this flight, and I had pre-ordered an AVML. For my AVML starter, I received a plate of chickpeas, beans, peas, raisins, and onions mixed together with a small side of asparagus. It was a bit odd, but it was reasonably tasty and healthy. My entree consisted of rice, dal, and paneer. Like most Indian food on planes, it was decently flavorful and spicy. The seats don’t recline that much, and the leg rest doesn’t have a foot rest, but again, for a non-longhaul flight, I think these seats are perfectly fine. The IFE is the same as it is on longhaul flights, so there’s a great selection, and the screen was quick and responsive. Cathay Pacific is known as one of the best carriers in the world and for good reason: they offer a great, consistent product. Even on a regional business class flight, you know you’re going to get a good, solid experience with great service, and this flight was no different. This entry was posted in Cathay Pacific, Travel, Trip Reports and tagged a330, business class, cathay pacific, flight review, travel, trip report on July 9, 2015 by Edward.